SPRUT Technology developer of SprutCAM will partake in the METALLOOBRABOTKA 2012 in Russia, between the May 28 - June 01, 2012 and will introduce SprutCAM system. We invite you to visit us (Pavilion 2, Hall 4, Booth 24C30) and get to know all our latest developments demonstration as well as actual training and help. Mechanical DATA our partner in Spain will partake in the BIEMH 2012 in Spain (BILBAO EXHIBITION CENTRE), between the May 28 - June 02, 2012 and will introduce SprutCAM system. We invite you to visit us on booth of our partners (2 / D-46 E-47 and 2 / D-32) and get to know all our latest developments demonstration as well as actual training and help. WellGot Technology Co., Ltd. our partner in Taiwan will partake in the TIAE 2012 in Taiwan, between the May 17-21, 2012 and will introduce SprutCAM system. We invite you to visit us (booth #A020, hall 1) and get to know all our latest developments demonstration as well as actual training and help. Interface Co. Ltd. our partner in Japan will partake in the INTERMOLD 2012 / Die & Mold Asia 2012 Show in Japan, between the April 18-21, 2012 and will introduce SprutCAM system. We invite you to visit us and get to know all our latest developments demonstration as well as actual training and help. CAD NC our partner in South Korea will partake in "SIMTOS" the 15th Seoul International Machine Tool Show in Korea, between the April 17-22, 2012 and will introduce SprutCAM system. FORMAPRO our partner in France had presented SprutCAM in the Industrie 2012 the trade show of production technologies in France. 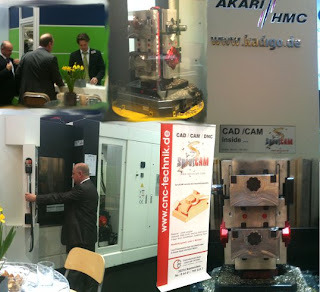 Datentechnik Reitz GmbH & Co.KG our partner in Germany had presented SprutCAM in "METAV" the International Fair for Manufacturing Technology and Automation in Germany. Datentechnik Reitz GmbH & Co.KG our partner in Germany had presented SprutCAM in "metallIT" the Software Trade Fair in Metal Trade in Germany.